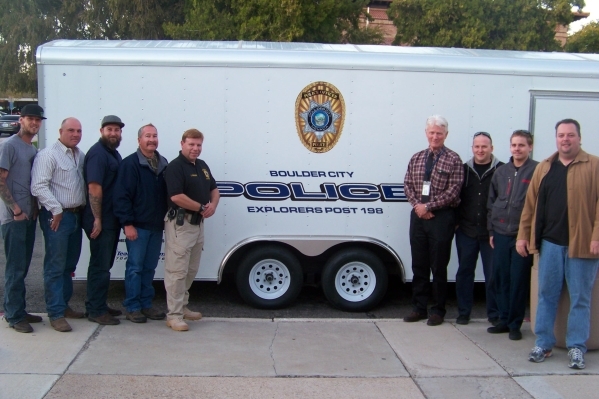 Advanced Vehicle Products donated a 25-foot trailer, affectionately called a “toy hauler” to the Police Explorers of Boulder City after noticing that the “really had a need, ” according to Gary Payne, manager of AVP. The company’s gift is valued at approximately $20,000 and will replace an outdated, unusable trailer. Payne said Advanced Vehicle Products, which builds and outfits police vehicles, had considered remodeling an old trailer, once used by the Explorers, but found it cost nearly the same to give them a brand-new one. The trailer will be used to transport the equipment and bicycles the Explorers use when traveling to competitive events throughout Clark County and elsewhere. The Explorers are led by Boulder City Police officer Scott Pastore, who serves as senior advisor, and Boulder City Police officer Tom Perkins, Boulder City detective Craig Tomao and Chadd Baker of Metropolitan Police Department in Las Vegas. The Police Explorers are open to young men and women between the ages of 14 and 20, who get the opportunity to have “a window into the world of a police officer,” Pastore said. They participate in special events as well as the day-to-day operations of the police department. They receive special training in areas such as traffic control, handcuffing, firearms safety (although they do not carry weapons), evidence/crime scene preservation, and arrest procedures. — Rose Ann Miele is a journalist and was public information officer for Boulder City for nine years. She can be reached at roseannrab@hotmail.com or at 702-347-9924.